Identifying molecules associated with a genomic region of interest in vivo is essential to understanding locus function. Using CRISPR, researchers have expanded chromatin immunoprecipitation (ChIP) to allow purification of any genomic sequence specified by a particular gRNA. 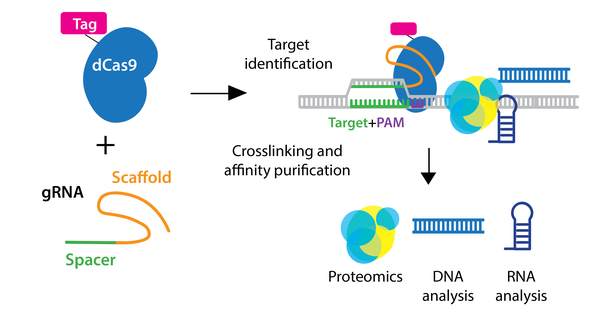 In the enChIP (engineered DNA-binding molecule-mediated ChIP) system, catalytically inactive dCas9 is used to purify genomic DNA bound by the gRNA. An epitope tag(s) can be fused to dCas9 or gRNA for efficient purification. Various epitope tags including 3xFLAG-tag, PA, and biotin tags, can be used for enChIP, as well as an anti-Cas9 antibody. Biotin tagging of dCas9 can be achieved by fusing a biotin acceptor site to dCas9 and co-expressing BirA biotin ligase, as seen in the CAPTURE system. The locus is subsequently isolated by affinity purification against the epitope tag. Compared to conventional methods for genomic purification, CRISPR-based purification methods are more straightforward and enable direct identification of molecules associated with a genomic region of interest in vivo. For CRISPR-based purification, design your gRNA sequence to direct dCas9 to a specific locus, avoiding known transcription factor and other protein binding sites. Browse, sort, or search the tables below for CRISPR plasmids to help purify genomic loci. Plasmids are available for expression in mammalian systems, bacteria, and yeast.